Looking for a stage for a school performance, or recital? Got a DJ set and want to be head and shoulders above the dancefloor? Creating a space for dancers at your event, or even raising a part of an existing stage? Our Revostage/ Intellistage products might be just what you need. 4 in total sized 2m x 1m £20 per section including risers. 2 in total sized 1m x 1m £20 per section including risers. 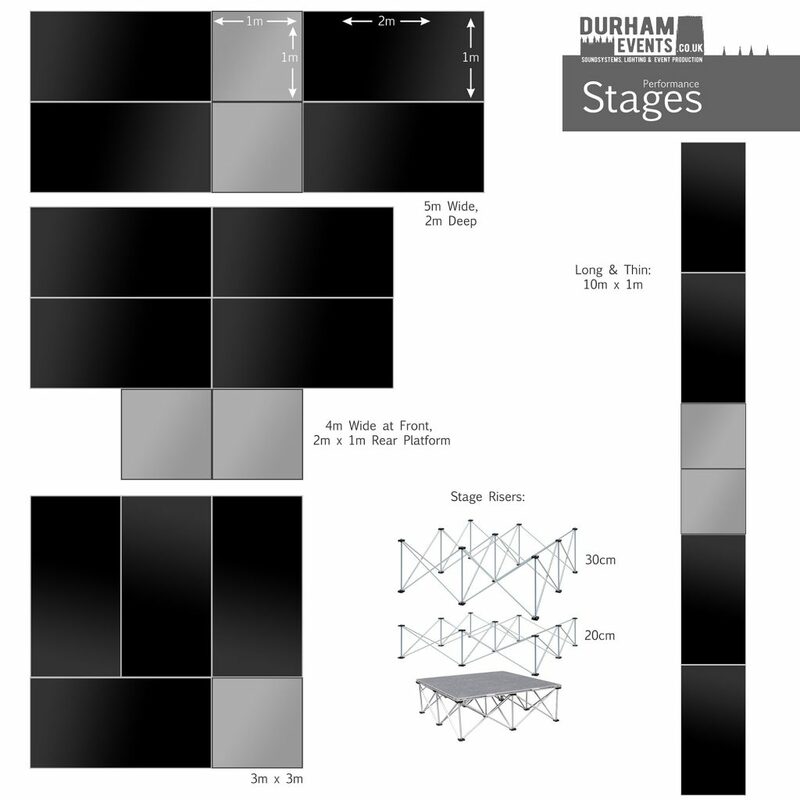 The 1m x 1m sections of this stage are foldable, so pack down to an extremely compact 1m x 50cm x 8cm sized sections, which means they fit easily in the boot of a small car, yet also manage to be very sturdy when laid out for a performance. We have 30cm risers for the 2×2 sections, and a choice of 20cm or 30cm risers for the 1m x 1m sections. The two 1m x 1m sections are finished in grey carpet, and the others have hard wearing black non-slip vinyl. Not seeing what you need? Get in touch with any questions. Please note that setting up stages takes a little time, so there will always be an associated cost for delivering, setting up & dismantling this kind of equipment.